A common frustration we hear from both startup founders and CEOs or marketing and sales executives in larger companies is how tough it is to streamline and quality assure your company’s pitch, so everyone is on the same page and knows what to say and how to say it to potential customers. In our experience, it can be a real headache to assemble that great, new sales team consisting of both veterans and newcomers, who each have their own take on how to pitch the company. And while it’s always good to have a personal touch to the way you pitch, a solid foundation based on an agreed, unified pitch structure can be tremendously valuable to everyone. Both inside and outside your company. That headache is something we care a lot about fixing. And our solution to this is something we call Master Pitches, which is only available to our customers with Enterprise and Business accounts. In the following, we will dig deeper into how you can begin authoring your company’s Master Pitch and share it with the rest of your colleagues, making it easy for them to read, practice and deliver your company’s values to potential customers, successfully and confidently. First off, ensure that you’re logged into the Pitcherific tool with an account that is also the Representative for your company’s Pitcherific Enterprise account. Only Representatives, and not ordinary team members, have access to the Master Pitches feature inside the pitch tool, so if the following does not appear to your then you’re not a Representative. After logging in, either create a new pitch or choose an existing pitch that you want to turn into a Master. If you’re creating a new pitch, you need to save the pitch before you can access the Master Pitch feature. With the pitch saved, or the existing pitch opened, go to your Toolbox in the upper-right corner of your pitch paper. Select it and then select the Turn into Master Pitch option in the list that appears. Employees who have been invited through the invitation form by you or other team members. Team members you’ve invited as a Representative. When your employees and team members have access to your Master Pitch in their list of pitches, they can begin to read and practice your company’s pitch. This opens up for a range of recommendations and ideas. As with any kind of pitch, practice absolutely makes perfect, so encourage your employees to practice the pitch till they feel comfortable with it. We usually see results after 10-15 rounds of practice, but this completely depends on the individual, and can’t really be boiled down to a simple, quantitative amount. Good pitches that customers can connect to and understand is a product of many iterations, many mistakes, improvements and learning. Communicate to those who are to use your Master Pitch that it’s a learning process and encourage them to collect their experience from pitching this pitch and share it with you. This allows for a very valuable feedback loop, and from our experience, a healthy discussion inside the company about how you present your company to the outside world. When you’re more confident with creating Master Pitches, we recommend taking things a step further by adopting a more data-oriented approach to your company’s pitches. Since you can create as many pitches as you want, you can also create as many different Master Pitches as you want. This opens up for doing A/B split testing of pitches and researching which of two, or more, pitches that result in better conversions or hit rates. Keep your feedback loop in mind and have one team use one Master Pitch and have another team use a different one. Collect their experiences and evolve your Master Pitches with what works and scrap what didn’t work. If you really want to take things to the next level, then we recommend that you take full advantage of your Enterprise-only features. 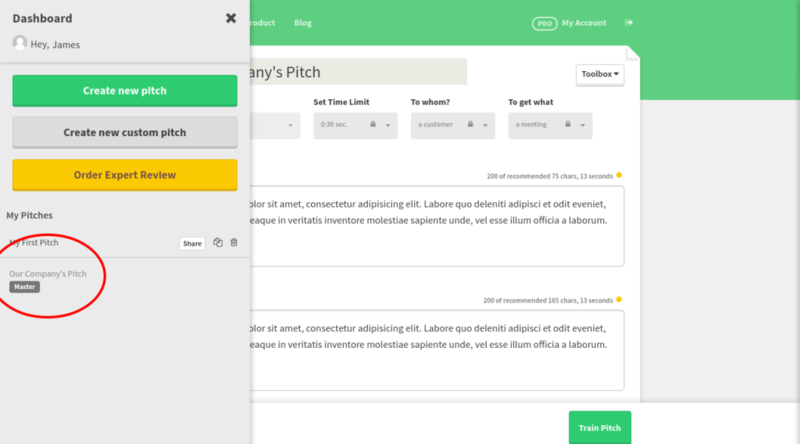 By combining creating your own Pitch Templates in the Pitch Template Designer, attaching Question Cards to it and finally creating a pitch with that template and saving it as a Master Pitch, you suddenly have a powerful way to upgrade your employee’s pitches while preparing them for any curveballs they might be thrown when pitching potential customers. Let’s break this approach down a bit. You’ve probably been used to the standard pitch templates in the pitch tool, or you’ve made a Custom Pitch and then made that into a Master Pitch. But when you have an Enterprise account, you can create your very own Pitch Templates that only your organization can view and use. This makes it possible for you to take your extensive knowledge and experience and transform it into a shared, learnable and trainable framework of communication that your employees can practice and adopt anywhere, anytime. It’s especially neat if you have different products or services that each have their own value proposition and way of being pitched to potential customers. With your custom pitch template in hand, let’s go a step further and add Question Cards to it. Question Cards are randomized questions that will appear like flashcards after your employee has practiced a pitch in the tool’s teleprompter. They don’t need to wait for the teleprompter to end, though, they can view the questions with a simple click, if necessary. The valuable thing about Question Cards is that they enable you to prepare your employees for any curveballs that you’ve experienced and know how to dodge. By attaching Question Cards to your pitch template inside the Pitch Template Designer, any employee who uses that pitch template will instantly be able to see your questions when they practice. And since you can also add an Optional Insight to each question, you can share knowledge with your employees, so they know what could be said if that particular question is asked. With your custom pitch template and your attached Questions, you’ve got some pretty powerful stuff opening up. Why not create different pitch templates for different products or services, each with their own Questions and insights and write Master Pitches based on those? By doing so, you can create a catalogue of Master Pitches for your employees, and especially for new employees who need to get up-to-date quickly, that appear right in their list of pitches, ready to be practiced. What happens if I change the Master back to Normal? The only thing that happens is that it disappears from the list of pitches of your employees and team members. This can be useful if you’ve received feedback and need some time to update the pitch without anyone accidentally practicing it before it has been updated.